Our Conferences, the Master Orator Championship, the Membership drives, all these have one direction, one purpose - to spread the Toastmasters movement. To allow people to join, learn, experience and better themselves. We find new ways of getting more people on board all the time. This is one of those attempts... Since the time I joined, in 2013, I attended every District conference (except for one in May 2014). Those were days when Whatsapp was not prevalent. 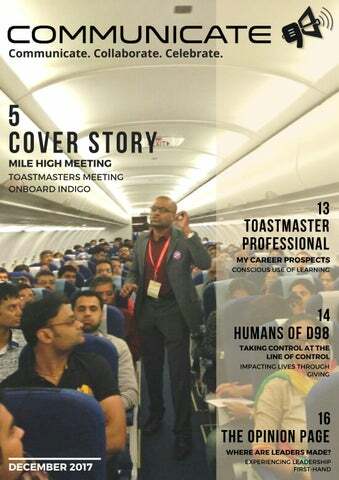 Most times, I’d meet Toastmasters at the airport who happened to book the same flight. At least 30 to 35 each trip. Toastmasters of Andhra and Telangana have by default had good representation because of the sheer numbers. As a member and as a District officer for two years, I have had this casual “we should do an in-flight meeting” conversations with others in the past. Never really went beyond that point. It remained a wishful thought. This time was different...No, no...no bug bit me. Confluence 2017 saw 60 odd Toastmasters from Hyderabad at Indore. Luckily for us, there was only one flight back to Hyderabad. As we boarded our cabs and headed to the airport I casually mentioned to Lasya Madireddy that we do a meeting. “Seriously?” Was all she said. I didn’t think it would be easy, what with the permissions and the protocol. As the word spread within the group about the plan, like second nature, people started taking up roles and organising the meeting. Q: A good number of club members do not renew their membership due to various reasons, one being that the repetitive structure or format that all the meetings are conducted in, fails to keep their interests. Having different themes for every meeting, conducting joint meetings are some of the methods that we have used, but again the basic structure remains the same. What is your opinion on this? Are there any innovative methods that any of you have come across? TM Sreeraj Menon, Toastmasters Club of Pune Ans: Hi Sreeraj, very apt question and excellent thought process. I really like my Toastmaster Friends thinking and asking about how to improve Toastmasters Meetings. Here are my thoughts; 1. I am a firm believer that more than the structure of the meeting, the content of the meetings creates a major difference to the experience of the member. 2. We need to work together. to help our members give speeches that can make a difference. One of the campaigns that we are planning is to launch “Speak to make a difference”, #S2MAD. You will know about this very soon. Majority of our speeches were made in a hurry, which creates a substandard experience for everyone included. Thus every speech will inspire others to give one, I have seen many clubs in our District already taking this very seriously by making mentoring of all the speeches qualitative and productive. The experience in a meeting with 3 such wonderful speeches is breathtaking. 3. We need to innovate: The role player reports have by far become very monotonous, to say the least. Some of the Ideas of how we can make it innovative are below a. TMOD – The theme of the meeting is a brilliant concept; One can also try Theme “You” where the TMOD speaks about each member of the club during his transitions. Some of the TMOD speak about Toastmasters as the theme when there are many guests. Some pick up a topic related to Public Speaking and Leadership which is very valuable to everyone. Some TMODs utilize their role to talk about a famous speech or a great orator. Making themes relevant to the occasion and Toastmasters makes a lot of difference. b. GE – The job of the general evaluator and all the role players should be a cumulative effort to create maximum impact. The GE should identify the areas where the club is lacking from the last 5 to 6 meetings and put it as a challenge or goal to the Role Players. For example, if the clubs meeting is being delayed from the last 10 minutes, give the TMOD a target to start the meeting on time, let that be his challenge. If the WOD and IOD are not being used, give the Grammarian the challenge to find out a way to make everyone use the WOD and IOD, give the Timer the challenge of giving a breakup of the time a speaker has taken for Introduction, Body, and Conclusion. Challenge the Ah Counter to find if the speakers identified have specific filler they want to eliminate and applaud any speaker who was able to do that in his speech. c. As you have very aptly mentioned, Joint Meetings, special meetings are an excellent way to bring variety to the meetings once in a while. A few special meetings that I have seen over the years are; Reverse Meetings, Special Screening of famous speeches, Milestone Meetings, Panel Discussions on a Leadership or Communication-related topic give the meetings an excellent outreach. ASK THE TRIO Very lately, I have seen some clubs celebrating milestones and meetings a priority, than working to improve the most Important Club Meetings. If we do not improve/focus on enhancing the quality of our meetings and creating an excellent culture in our own clubs; milestones and special meetings do not make any sense. 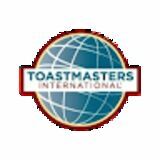 So let’s try to make a difference, while we take the stage in a Toastmaster Meeting, for us as well as for the audience. Q: With Pathways almost knocking at our door, do you foresee any changes/challenges for the club excomm? If yes, how do we address them effectively? TM Smita Mishra, Division H Director, Elan Toastmasters Hyderabad Pathways is an exciting and a refreshing change that is coming in our District and we are thrilled to welcome it with open arms. TI and the District Machinery, as you are well aware, is ready to help bring this change and help transition very smoothly. We have trained all the District Officers about pathways in the training segments; Our Chief Ambassador is all geared up; we have also got Pathway guides in place who are going to personalize this transition to each and every club of D98. There will be no changes, apart from the Educational Track, DCP Goals, Edu Goals required for Contests and the approach to evaluation of the speeches, to the role of the Excomm. In fact after Pathways it will be easier for the VPED to track the educational goals and progress of each member in the base camp. The VPPR will be delighted for the fact that this will create a newer and a dynamic audience and reach. While saying so, change is not always easy. Although we are confident of the smooth implementation of the Pathway program, we also anticipate a few hiccups in terms of Technical as well as Knowledge front in the pathway application. We are in continuous dialogue with other Districts and TI in our monthly meetings and Mid-Year Trainings. We have all the bases covered and are ready for any unforeseen situations that might crop up along the way. With the strength of the Pathways Team and our District Officers we are ready to welcome and celebrate Pathways in District 98. Q: We know DCP is a measure of club success. However, that is never a measure of club quality. How are we establishing club quality? Not considering DCP, what parameters do you look at? TM Manasa Inampudi, XLRATORS-The Miyapur, Hyderabad Thank you Manasa, for choosing the right words to describe DCP. Yes, DCP is a measure of club success. There have been many opinions and studies to bring out parameters that can help evaluate the quality of the club but nothing very concrete could materialize. Quality is a relative term, what one feels about a quality meeting will not be the same for the other. This thus brings to the point of how we can ensure that there is Quality in a Club, I believe the quality of the club begins in planning what we want do and then evaluate and revise it as necessary, there are tools that are already in place for any club to do the above; 1. Club Success Plan – This is most comprehensive document that includes everything of how you would want to run your club. This has to be discussed and debated to include all the guidelines which would help bring things in order. 2. Club Officer Training – Attending the club officer training is not only important from a DCP perspective but is also important for all the EC members and is part of the oath that we took. 3. Club Visit Reports – The Club Visit Reports filed by the Area Director is also one important parameter that you can use to evaluate from a Trained District Officer point of view and make necessary coarse corrections. 4. Club Contests – Club speech contests for me has always been an exhibition of the strength of the club. 5. District Conferences – Area, Division and District Conferences are an excellent place to evaluate and mark our club speeches to those of the contestants hence attending the speech contests will ensure we have a good reference point for ourselves. 6. DCP – DCP is another parameter to check where each of our club stands. If our actions as a club follow a particular plan and as a club we continuously evaluate and enhance those actions Quality becomes a by-product. Quality, according to me, is the process of continuously achieving the goals that we have set for ourselves while upholding the TI Values and the Club Mission and there are many checkpoints, as described above, to check and re-check what we are doing. DTM UJJAVAL MODI | AMDAVAD TOASTMASTERS CLUB Since September 2013, after being a member of Toastmasters I have grown by leaps and bounds. No words can describe the person I have transformed into. Before my term as an Area Director, around a year and half ago, I was involved in building a club in Vadodara. I noticed many clubs in Gujarat; failing due to performance not being up to the mark. Inspite of clubs organized various events, they were scattered because of communication gap. People did not know each other that well, bonding was the missing factor. In order to overcome this, I conceptualized Gujarat Area Meet, a platform where members from entire Gujarat can be under one roof to network, share their ideas and enhance their team spirit. This initiative helped me create a family of Gujarat Toastmasters. I am fond of digital platforms. I leveraged that interest to connect people digitally. Thus came about the WhatsApp group, Facebook page, and Instagram account. Gradually people started floating messages about anything special and regular meet posters. Members across Gujarat were recognized for their achievements which boosted the confidence of everyone. At times, quite intentionally milestone events were rolled out at social platforms which gave rise to a very positive competition and learning. This resulted in personal growth as they got another platform to discover their potential. As the bonding got concrete, collaboration improved. Throughout my journey, I tried to motivate people by my infusing positivity. I kept on hosting some events/trainings every quarter which gave me an opportunity to hone leadership skills as well as to strengthen the unity amongst members. One of the most successful ones is ‘Quiz-O-Toast’ an online quiz contest of three days for which we had a participation of around 70 members across District 98. Quiz-O-Toast was the first initiative from this division. I am overwhelmed to share that the team worked tirelessly to make it work. We did have hurdles that we as a team encountered and thus this event reinforced the belief that if you have something positive in mind and an intention to contribute to society, the universe will conspire to make it happen. I along with my team started looking for new clubs; we did demo meets, open house etc Though we failed several times, we were always hopeful. We distinguished tangible and intangible goals and dreamt quite realistically. Lastly, I’m very much thankful to each and every member of Gujarat toastmasters for being by my side in roller coaster ride-President’s Distinguished Area and for raising the flag of Gujarat in the map of District98. Edited and compiled by Malvi Take a moment to give us feedback for this article, or the issue HERE. You might get published in Letters to the Editor! TM NIDHI DUBEY | PALAVA TOASTMASTERS CLUB “The fear we don’t face, becomes our limit” – Robin Sharma I was always afraid of speaking in public; limiting all my other positive traits. Being an HR Professional, interacting with people is my job. Never had trouble with one to one interactions but speaking in a group or on a stage, I either forget what I wanted to say or fumbled. My first Toastmasters meeting was thrilling! It was a new experience and now, that journey has reached meeting number 5. I received the first major boost to my confidence when I won the award for the best prepared speech of the day for CC1. It really changed my mindset about public speaking and I realized ‘it’s all inside you’. Toastmasters has ignited that spark in me: YES, I CAN DO THIS! Now, I feel more confident about expressing my opinion and thoughts. People around me have noticed a positive change in me, both at home and at work. At office, I have taken initiatives in organizing events; giving better presentations because of better content and improved presentation skills. At home, I am able to communicate better with my family. TMÂ SAI SACHIN | HYDERABAD TOASTMASTERS CLUB "There are teachers in our schools who teach and help us grow through our formative years. There are our parents who care for us more than we could ask for in life. There are some people who go even beyond and do both, i.e. teach and care for us when we join our new school in life - Toastmasters, such is my mentor Shara Ragha Wardhan. His constant guidance: When any Toastmaster wants to take up an ExCom role, he/she always thinks: "What's in it for me?" I had the same question when I wanted to pitch in for VP Public relations position of the Club. We discussed and he shared many of his ideas and the one important idea "always be creative, go beyond the usual. Be it a VP-PR or a speaker, be innovative." Two things about him that have been pivotal in my journey as a Toastmaster: His humility: I had joined Toastmasters without attending any meetings. Before I could attend my first meeting, I added Shara, who was the Club VP-Ed, on Facebook. My one hour FB chat with him included basic questions about Toastmasters and Public Speaking. Ranging from, "Is there any hierarchy in being a member?" to "Will I be forced to talk in table topic?" He answered every question. That enthusiasm he showed in his responses demonstrated his belief in the platform. I was more than convinced that he will give what he received. This idea still rings in my head. I had the answer to my question "I will do things creatively from now on for my learning and steering the club forward". I, as the VP PR, started to look at things differently, catering to the needs of the Club and individual members as a whole. He. as the president helped me execute my ideas, guided the ExCom throughout and Bingo!! Within six months our Club got the Best Club award in the division and I got the best social media presence award. I requested him to be my mentor to which he agreed instantly. As we conversed I received honest and critical appreciation about my roles and speeches. I had not met any Toastmaster until then who was equally committed to his work as an ExCom member (clearing all queries for prospective members) and being a helping hand always for his mentees, which displayed his humility. TM AMITH BHANUDAS |Â TOASTMASTERS CLUB OF PUNE-SOUTH EAST TM Amith Bhanudas is a Past President of the Toastmasters Club of Pune South East. In this article, he shares with us his experience of going to the LoC and imparting job-skills training to the locals. I have always wanted to enjoy diverse experiences. But, experiences need directions. I found a direction towards a memorable experience through Mr. Sarang Gosavi and his NGO, ASEEM Foundation, both from Pune. Mr. Gosavi and ASEEM have been involved in various social, educational, and cultural initiatives across India. Mr. Gosavi spoke at TEDx about his experiences in the Kashmir Valley. As a TEDxPune volunteer, I got to understand his work intimately and was inspired and enthused by the efforts. I connected with him and his NGO and volunteered to work for them. Incidentally, ASEEM was collaborating with the Indian Army in Kamalkote village of Uri town in Jammu and Kashmir. Kamalkote is located near the Line of Control (LoC) and is sensitive in many aspects. The purpose of this initiative is to build trust with the locals by providing them vocational training so that they can finally pursue government jobs in IT. Eager for experiences, I was only too glad to volunteer as a trainer and started preparing for it. My tryst with the locals of Kamalkote began on 14th August 2017. I stayed with the Indian Army at their guest house. The training began on 16th August for 11 boys and 10 girls. The locals were inviting and even enterprising. The training experience was great. My work mainly included providing the local graduates exposure in computer skills such as MS Office, especially Excel. I focussed on train-the-trainer sessions to enable sustenance of future batches. Alongside, I introduced them to Organizational Culture and operations. This took care of efficiency and process to run the center. I collaborated with the Army, the village head, and ASEEM to introduce a proper fee-structure and help sustain future batches. None of this was easy. Our biggest roadblocks were power and connectivity. Frequent load-shedding hampered schedules. I had to travel 5 kilometers to make a phone call! The sweetest challenge of all as a Toastmaster was the language issue. Actually, the locals speak Pahadi/Punjabi and Urdu and rarely use English. So much for the Grammarian and the WoD! The good thing was they do understand Hindi, and that was the bridge. The only sensitive area was security. I had to be escorted by the Army to and from the IT center. All challenges faded as I had the locals, the Army, and their indomitable spirit supporting me. I am glad that this training program is helping the Army build confidence among locals and bridge differences. Importantly, 20 of the valleyâ&#x20AC;&#x2122;s youth from the valley are more confident about training others and taking up jobs. The people there have great potential. They are hopeful of a bright future, despite their conditions. I thoroughly enjoyed my experience of training youth along the LoC and look forward to many more such illuminating experiences. Hope you enjoy some great experiences too! Edited and compiled by Taaha Take a moment to give us feedback for this article, or the issue HERE. You might get published in Letters to the Editor! that there is an overnight shift in the way things are construed and concluded. This shift creates confusion in the club for you have two categories of people in the same room when the club meets next. The first category includes trained leaders and the second involves perceived leaders. Now you see the crevice caused by the perception. It is this perception that widens the gap and thus the ground reality in the club is distorted. There is a simple solution to prevent this distortion. It is to explicitly remind the EC members during training that they are members who’ve got a chance ahead of other members to try their hand at leadership and to not coin them as trained leaders as we often do. The complexity doesn't end here. The trained leader of the club is now ready to expand the canvas and take up the larger mantle of district leadership, thereby commencing a new saga. The so-coined leader is so obsessed in making a difference in others lives that they hardly have the patience to introspect. The music is so loud in their ears, often the lyrics are hardly heard. As they prepare to take up the higher pedestal of leadership at the district level (as it is assumed to be so) they deem it their sovereign duty to lead alone and to lead always. The third and the terrible gap that affects the value proposition on offer to the member resurfaces here. As duty bound as they should be, we must realize that the heart in the duty to lead must be at the right place. In Toastmasters, you don’t become a leader to lead alone or to lead always.